The extensive Gasteinertal ski area is one of the largest in Austria - you need almost never ski the same piste twice in a week on its superb slopes! An unsung hero of the Austrian Alps, the resort of Bad Hofgastein offers miles and miles of beautifully groomed slopes. It’s a great option for serious snow buffs looking to try somewhere new, and with over 200 prepared pistes on offer here, we are sure you won’t be disappointed. The resort of Bad Hofgastein is famous as much for its outstanding natural thermal springs as its world-class skiing. It’s a relatively quiet resort with a relaxed informal approach to après ski, yet has a bustling pedestrianised centre with cobbled streets and a fantastic choice of bars, restaurants and other amenities - not forgetting to mention its famous spas. There’s something for everybody on the pistes; the gentle nursery slopes at Angertal provide an ideal introduction for beginners from where they can progress on to the gentle blue runs on the Schlossalm or Stubnerkogel. For intermediates, this is ski-your-heart-out country! Bad Hofgastein offers a huge variety of red and blue runs, which are linked to the nearby resort of Bad Gastein to form one large skiable area. In addition, the Gastein valley has a further 3 ski areas, offering total of 250kms of well groomed, often quiet, pistes which are linked by the efficient and frequent ski bus service that runs throughout the resorts, and is covered by your lift pass. 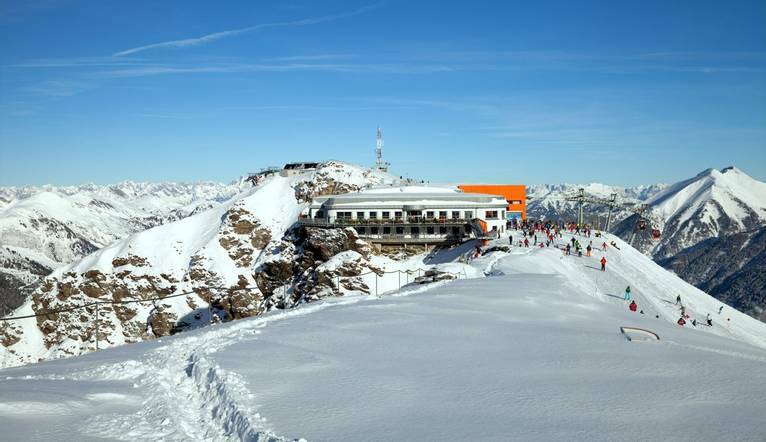 Advanced skiers will love the testing runs on the Stubnerkogel and a there are a couple of fantastic blacks to try out on the Graukogel, as well as the highest sector of the ski area above Sport Gastein, which has a base at 1600 metres and a snow-sure top lift at 2685m. The Tour Leader was excellent; he expertly guided the group each day ensuring that we maximised our skiing experience. The resort offered a huge range of pistes which were well linked and easy to access. The hotel was also excellent, offering great meal options from the buffet and spa facilities when relaxing in the evening. All in all, a great holiday! Great location and hotel, and the ski area and snow conditions were excellent. The organisation and planning for each day by the Tour Leader was also brilliant. We are based at the excellent Johannesbad Hotel Palace which lies a short walk away from the resort centre with the ski-bus stopping virtually right outside. This friendly hotel will provide a great base for our ski groups and with drinks included at dinner – some fun and sociable après-ski evenings are sure to be on the cards. This comfortable hotel has excellent facilities, including bar with live music, indoor swimming pool, sauna, steambath, as well as an excellent wellness area to relax in after a hard day on the slopes! Free Wi-Fi is available in the reception area. All the well-furnished rooms feature a hairdryer, bath robe, radio, telephone and satellite TV. The transfer from Salzburg Airport to the hotel is approximately 2 hours, depending on weather and traffic.